Welcome to our Blog. We spend a large part of every year travelling in our beloved Rapido 741F motorhome. We post regular accounts of our adventures as well as the occasional article, and of course, pictures. Please click on the Archive pointers to see more. We awoke with snow on the ground; our English friends had left at first light. 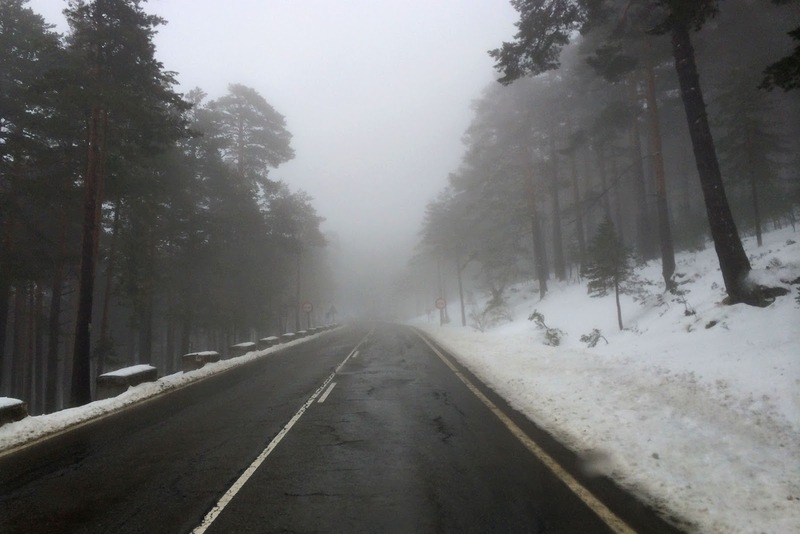 Despite the snow, we decided to do the mountain road to El Escorial as the sky didn’t look too dark and heavy with the white stuff. In fact the drive wasn't bad, some snow flurries, but the road was clear and the weather just wet and misty at 1850 metres. Not too much fun though for the struggling skiers from the resort at the top – tramping along the wet road and moving in and out of the gloom on the slopes. 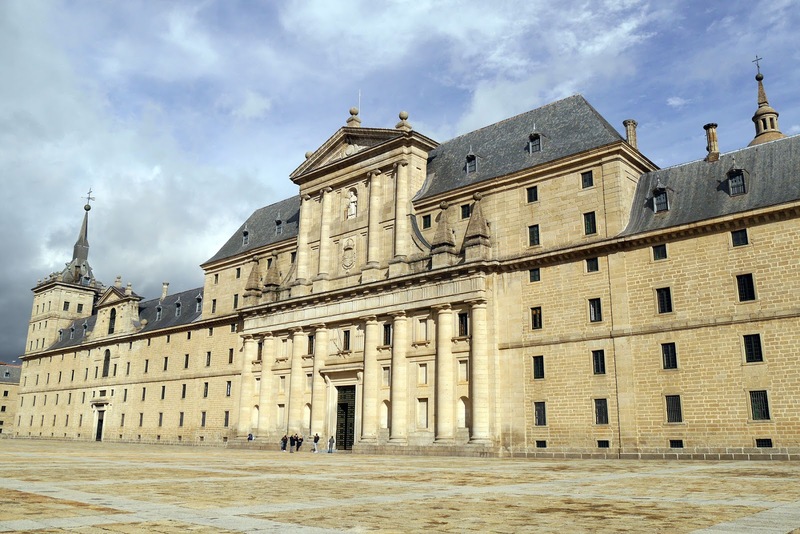 San Lorenzo de El Escorial is the name applied to both the Royal monastery and residential palace of the King of Spain, and the town in which it resides. 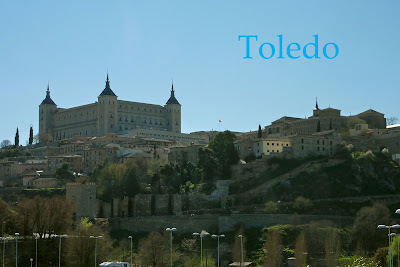 There is another town, called simply El Escorial, a couple of kilometres away. Arriving at San Lorenzo de El Escorial we nearly twisted our heads off trying to spot somewhere to park a motorhome, eventually electing to deposit ourselves directly opposite the monastery: €4.60 for 2 hours. That meant I had to dive out of the guided tour half way through to get another ticket, but the tour guide and staff were very helpful – those that could speak English anyhow. 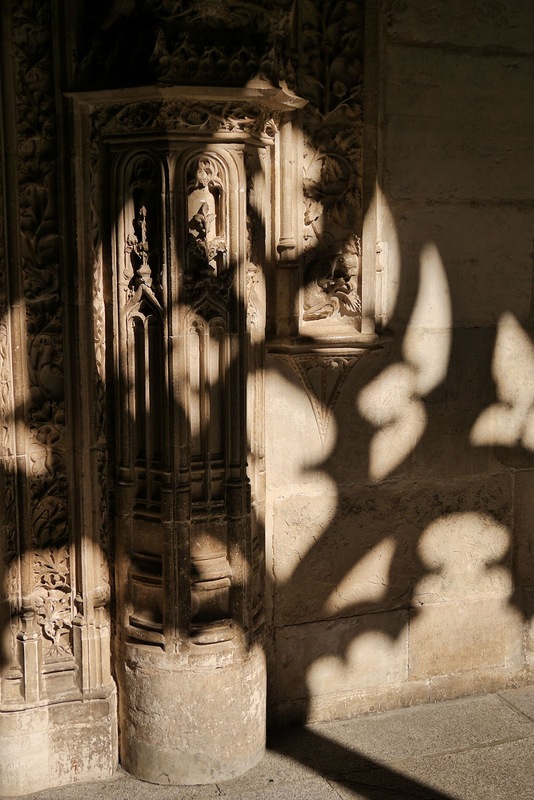 Perhaps the most memorable fact imparted to us by the guides was that the great monarchs, once their spirits had departed this earth, spent 42 years underground in a sack of lime – before being transferred to their splendid bronze and marble sarcophagi and pride of place in the Pantheon. 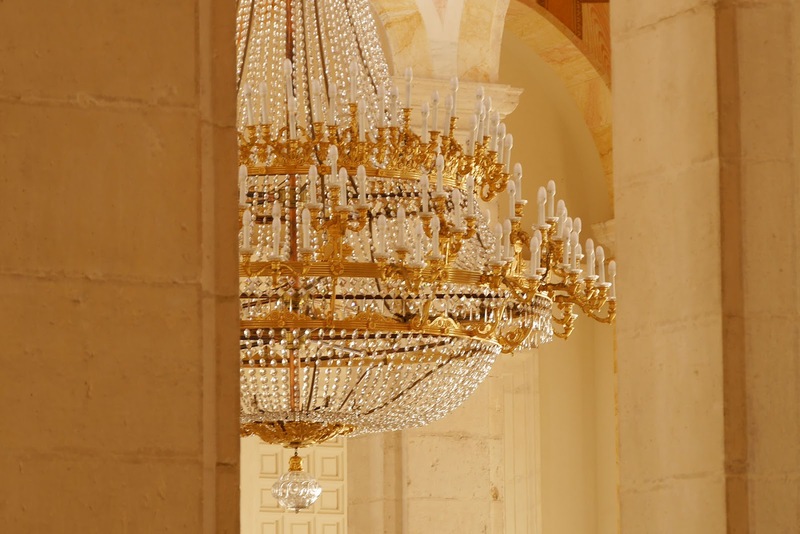 The reason behind this was so they didn't stink the place out in the meantime – the marble being porous to the fluids released by decomposing bodies! 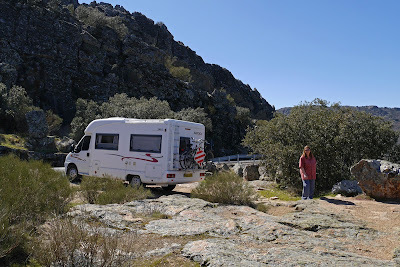 We couldn't find anywhere suitable to stay for the night around the streets, so went to the El Escorial campsite out of town, a huge and at the time, rather empty resort site: 18 euros a night – top rate for an ACSI site. Sue had another battle with reception over wanting to hang on to our passports. 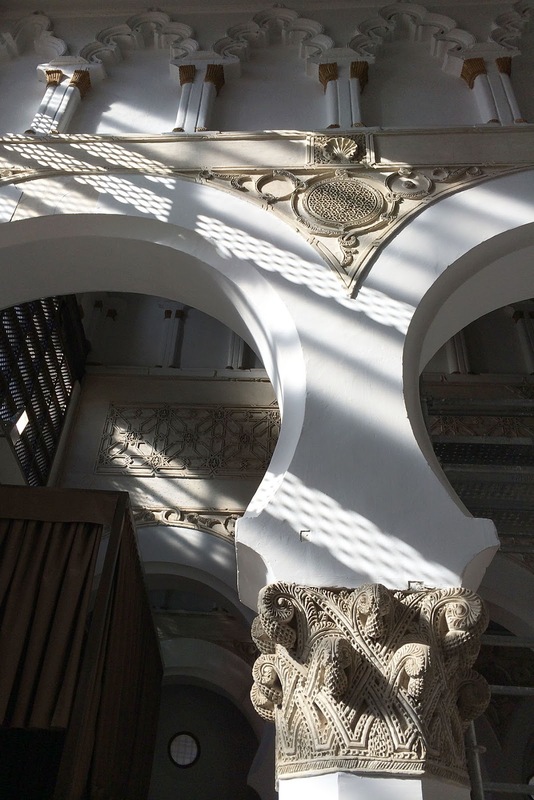 A return to the palace to see the art and architectural museums. After that I had seen enough but Sue’s cultural stamina meant she did the library as well, which of course was very interesting! 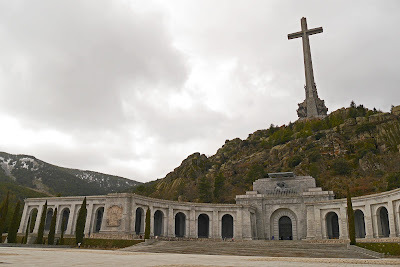 After this marathon of culture assimilation we drove out of town again, back towards the campsite to see the Civil War monument at Valle de Los Caidos (Valley of the Fallen). Built at the behest of General Franco to honour the dead of the Spanish Civil War, it took 18 years to complete and features a vast basilica hollowed out of the granite hillside. 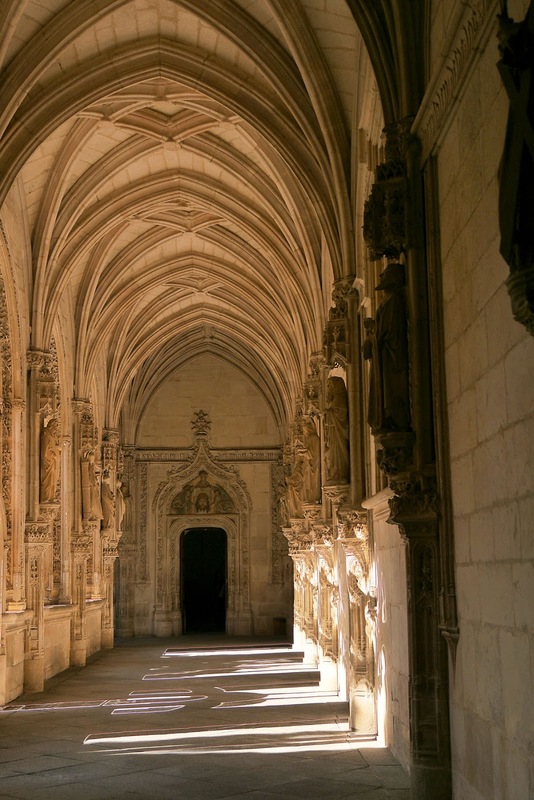 It is a long drive through the woods to reach it and, astonishingly, the interior is larger than St Peter's in Rome. On top of the 150 metre high granite outcrop is a 150 metre high cross, dominating the stupendous setting and visible 20 miles away. 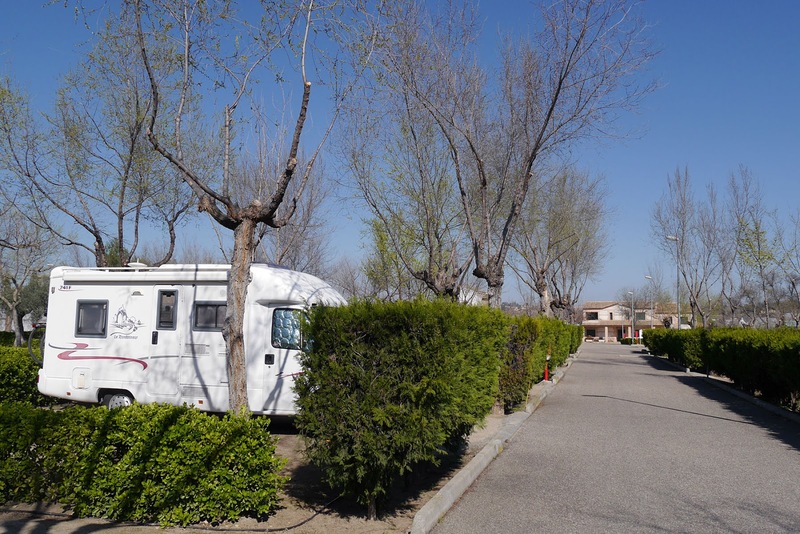 After that we hit the main roads down to Aranjuez and the campsite on the perimeter of the Royal Palace gardens. A pleasant, friendly campsite with a good shop and a 20 minute walk from town. Quite a few Brit vans around, in transit mostly. We signed up for a weeks wi-fi but it was not very fast and kept logging us out, also you could only log in one device at a time. Just as we got into bed, there was a distinct burning smell from underneath it. We couldn't decide whether it was the electric heater, battery charger or battery, so I switched everything off and disconnected the hookup, putting the fridge back on gas. All seemed fine until the evening when the charger kicked in again on its full charge cycle. Peaking at 14.6 volts for a few seconds, then down to 14.3, it became obvious that the charger was the source of the smell and that it was getting rapidly worse. I switched everything off again and disconnected the hookup. We took the opportunity of a free ride into town on the road train or Chiquitren and did the palace first. The Palacio Real de Aranjuez was designed by the same men that designed El Escorial and was to me probably more impressive than El Escorial, especially the Arab room and the Sala de Porecelana, an amazing room of oriental bas-relief porcelain plates which totally cover the walls and ceiling. They are very strict about photography inside, which is a shame, but par for the course. We then had a fine 3 course luncheon in the Rincon de Godoy restaurant on the opposite side of the square. Traditonal style and service, excellent. With a half carafe of wine, water and coffee, it came to only 32 euros – fantastic value. 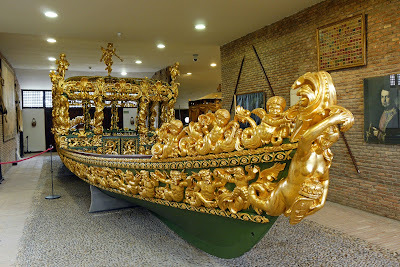 The Chiquitren does trips around the town and royal gardens, including the museum of royal barges, which was fun and saved us a hell of a lot of walking. 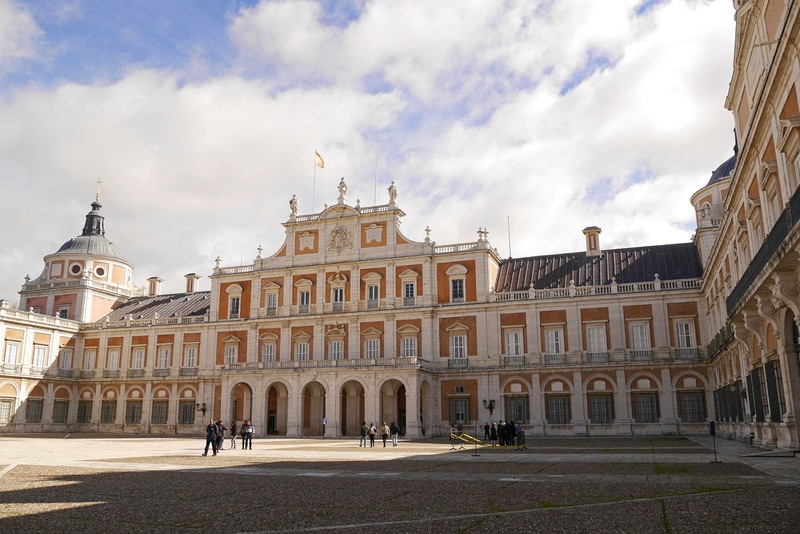 Interestingly, Joaquin Rodrigo’s glorious Concierto de Aranjuez was inspired by the palace gardens and is meant to evoke the sounds of nature in and around them. We then had a bit of a wait for the last road train back to the campsite, but a good day, without the rain! Day 23 to 25. 3rd to 5th March. The weather got colder, but the skies were clearer and we enjoyed the sunshine and a nice cycle trip into town and some shopping. I stripped the charger down but could find nothing wrong with it. Apart from a little dust inside, it was fine?! 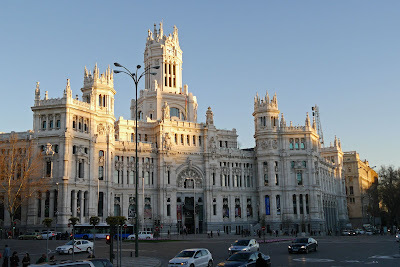 Our day trip to Madrid, and gifted with a cloudless sky. 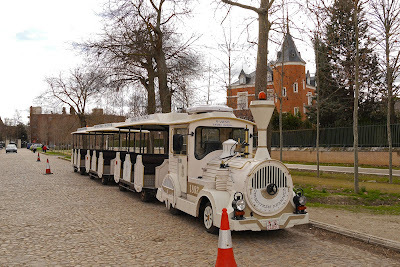 A five minute taxi ride to the station cost €12; the Linea C3 train from Aranjuez to Madrid (very modern, smooth and slick) €8 return for a 50km journey! 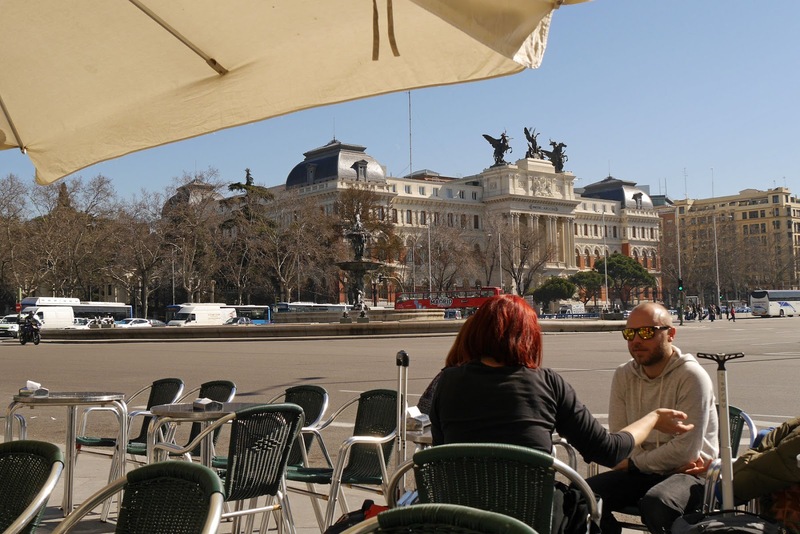 Our first stop was for coffee and "tosta rustica" in the Cafe Brilliante, across the roundabout from the station – loud, manic, but a great place to adjust to the buzz of the city. We decided to do the city tour bus: day ticket €21 each. Route 1 before lunch and Route 2 after. You absolutely have to get a top deck seat to get the most out of this, and it's still not easy to get good photos of anything, but the commentary does give you an introduction to the city. 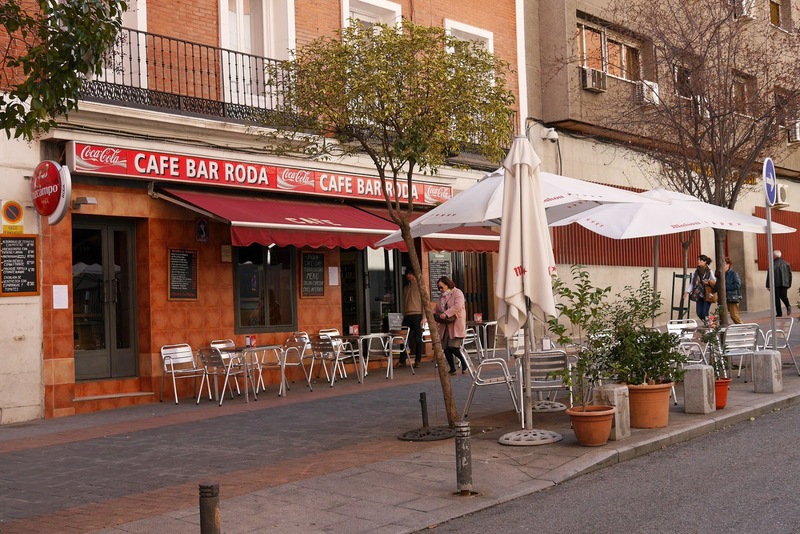 Steering clear of the numerous tourist restaurants on the Paseo del Prado for lunch, we found the local’s Café Bar Roda on the Calle de las Huertas. Menu of the day: Salmorejo, a cold, creamy deep pink-orange summer tomato soup originating in Córdoba, made with tomatoes, bread, oil, garlic and vinegar and garnished with diced Spanish Serrano ham and hard-boiled eggs. Followed by paella, and creme caramel. 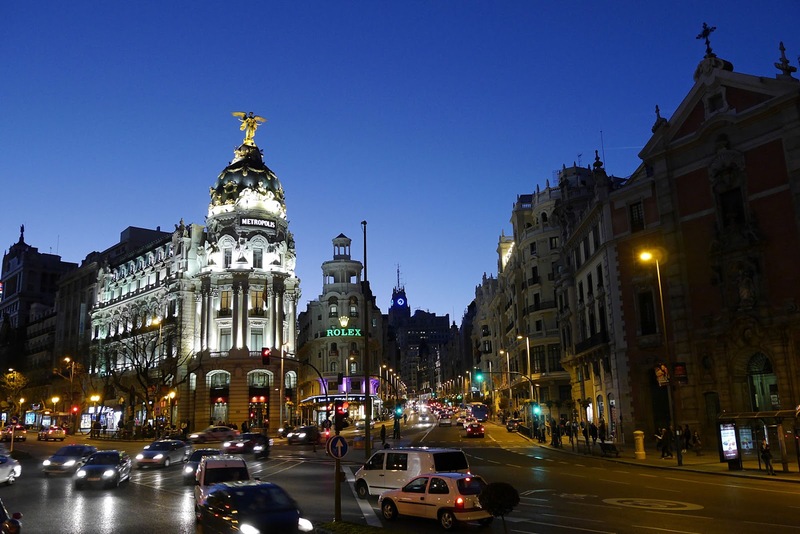 With a glass of red wine, only €22 for two! The menu of the day hit the spot! The American battleship Maine which accidentally blew up in Havana, Cuba on 15th Feb 1898, precipitating the Spanish - American War! Unfortunately, closing time intervened at the art museum so we missed out on the opportunity to gaze at 1300 artworks based around the former Spanish Royal Collection. Shame – however we did have time for another trip on the bus (Route 1 again) as the sun went down, and a couple of beers before the train back! A big clean up day before we moved on. Preparing to leave the campsite, I finally found the source of the nasty burning smell – the electric hook-up lead was welded to the side of the van! After emptying all the kit from under the bed (no five-minute job) and removing the cover from the fitting, the cause was obvious – a terminal screw had come loose and arcing between wire and terminal had melted the bits together. Getting the plug out called for a little restrained violence but eventually it gave up and we could pack up and leave. Next stop: Toledo. We picked up some LPG on route and were loaned yet another different adaptor by the garage. The only campsite in Toledo is Camping El Greco and it’s pricey; although the pitches are a reasonable size, entry into them is cramped and could be difficult if you have a large van. At this time of year though it was fairly empty. To get us connected to electricity again I removed the hookup fitting and cut out the electrical part, then fitted a plug onto the cable inside the van so that the lead could be passed under the flap and through the hole to the plug. A faff, but it did the job. 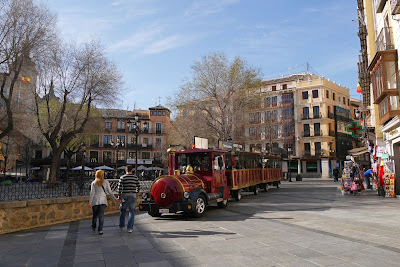 After a late start we just managed to catch the 10.00 am bus into town: just €1.40. It was still cold up on the town square, but the sky was clear and the tourist office was open and they gave us another map with the attractions printed in English on the back. The only way to really see this town is on foot, the ubiquitous road train is limited to very few streets and the City Tour bus only does the town square and then around the outlying countryside. The low sun was only just reaching its fingers into the narrow streets by 10.30; first stop was the Iglesia de Santo Tomé to see the El Greco painting El Entierro del Señor Tomé, probably his most famous (the one about two saints coming to earth to lay a local notary into his grave). Entrance was €2.50 a head plus one euro for the sound guide. We were just in time, as a coach tour packed the hall shortly after we arrived and individually they never got close to the painting! 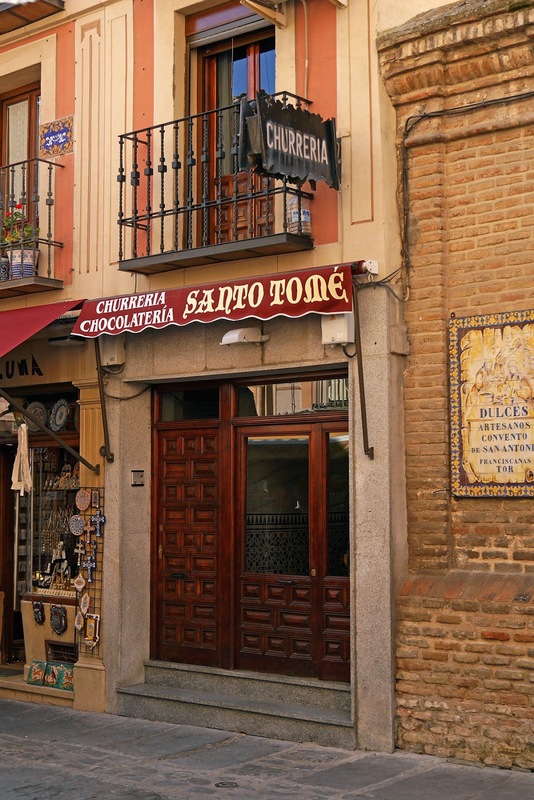 After some wonderfully warming hot chocolate and churros in the tiny Santo Tomé Churreria, we then headed down to see the El Greco museum, stopping first to look at the Sinagoga del Transito and Museo Safardi. As it was Sunday, entry was free. The Museo del Greco was also free, but the sound guides €2 each. 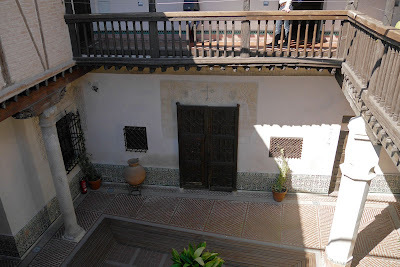 The museum is worth a visit for the house and gardens alone, even if you are not a fan of El Greco; a feast if you are. Nearby is the Sinagoga Santa Maria La Blanca, undergoing restoration but some lovely stucco work still evident. 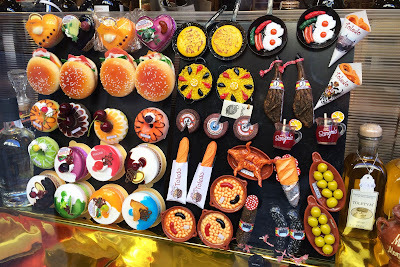 They are big on marzipan in Toledo, so we went for some marzipan refreshment at the Confiteria Santo Tomé, apparently the best stuff in Toledo, for which is is duly famous. We finally got to the main event, the Catedrale de Toledo, a vast edifice for which you are charged the princely sum of €8 (including audio guide) at the gift shop across the road. It is magnificent nonetheless, probably one of the finest we have seen. Another glorious sunny morning but still cold. 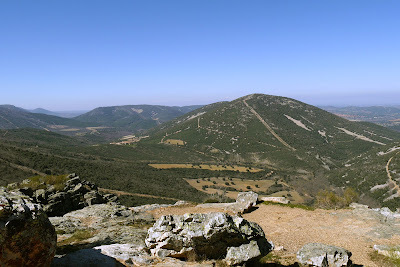 We paid our €60.60 bill for two nights and headed out of town for the Parque Nacional de Cabaneros. Yee ha! the open road! We found a wonderful lunch stop at Risco de Las Paradas, a spot made famous in a 1928 poem by Spanish essayist Felix Urabayen. ...and a view to die for! 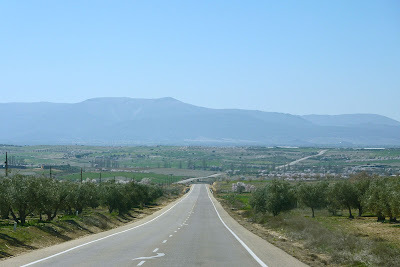 Just around the corner on the flat valley floor is vast and elegant Finca. 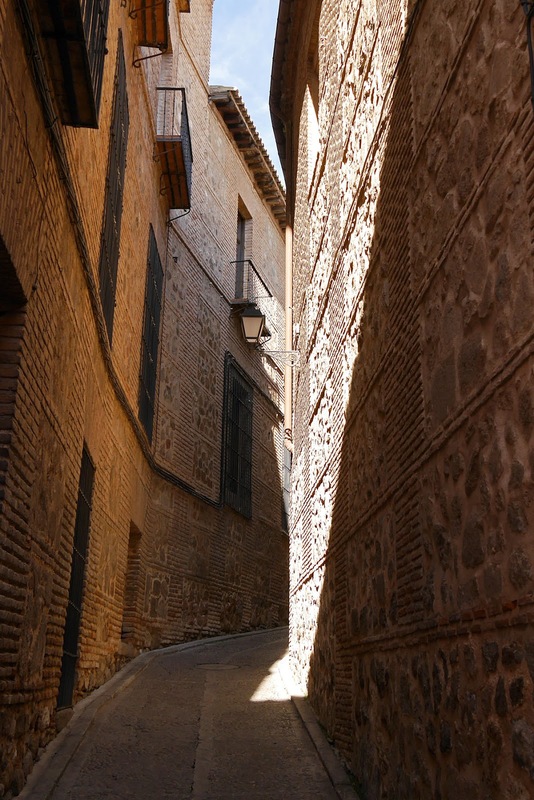 Curiously, the wonderfully smooth black tarmac we had been enjoying so far that morning curved into the Finca entrance and came to an abrupt halt – now, there’s influence for you! 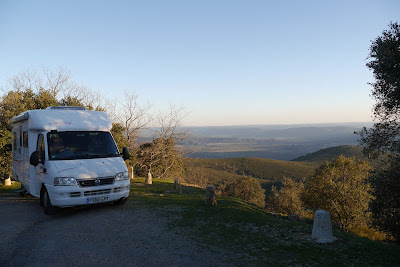 Soon after, back onto the rough and broken tarmac we found a fabulous pitch for the night overlooking the valley floor. This space is probably used for parking on hunt days, so is probably a spot to avoid at weekends if you don’t want a gun waved at you! Ian is an ex-seagoing MN Marine Engineer Officer. Born and educated in London he joined the P&O shipping group in 1970. After completing his cadetship with Trident Tankers he tired of long voyages to the Persian Gulf and transferred to P&O General Cargo shipping, visiting New Zealand, Japan, Hong Kong, Singapore, Sri Lanka, India and Pakistan. Later he moved to P&O Passenger shipping and its North American offshoot, Princess Cruises, enjoying the start of the cruising boom in the Caribbean, Mexico and Alaska. Ian moved to Cornwall in the mid 1970’s after his parents retired there and soon bought his own property. Coming ashore after 12 years he obtained a Diploma in Industrial Management and worked for a year with a company producing hydraulic equipment for racing and luxury yachts. Whilst in their employ he worked in Italy on a luxury yacht and also for Tony Bullimore, the single handed yachtsman. 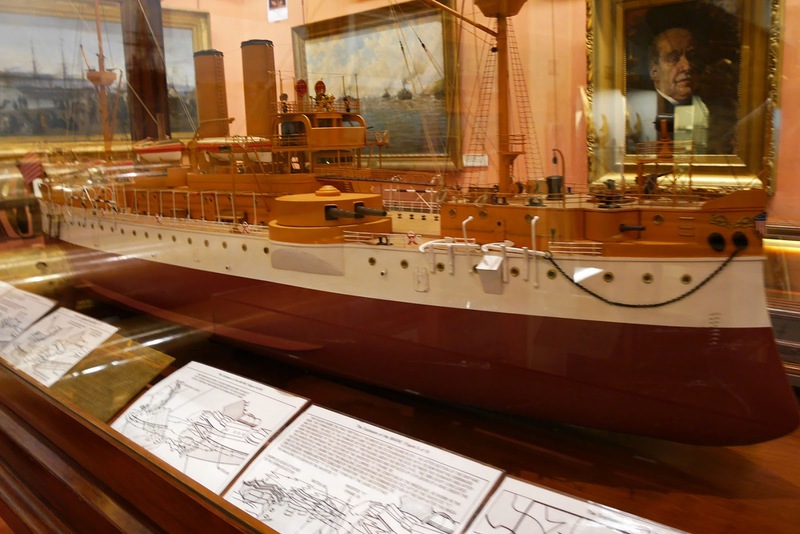 On Tony’s trimaran the ill–fated “Spirit of Apricot” he sailed as a crew member from Rhode Island to Quebec, an unforgettable experience. He then returned to sea as Chief Engineer for 8 years, before taking the post of Project Manager in a ship repair yard for 3 years. He returned to sea for a final four years, this time taking with him Sue, his partner since 1990. 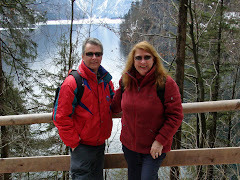 Sue and Ian met whilst sailing yachts in the mid eighties. They considered buying a yacht for long distance sailing, even the round-the-world trip, but bought an old campervan, the bug bit, and now they spend most of their time in their Rapido 741F. Sue is a retired Midwifery Sister. Starting her career as a pre-nursing student within The United Sheffield Hospitals, she chose to undertake her General Nursing Training at The Sheffield Royal Hospital to become a State Registered Nurse. Sue was one of the first Student Nurses in Sheffield to be offered a three month Obstetric Course and loved it, so a change of career into Midwifery became essential. She returned to The Jessop Hospital for Women, Sheffield, and completed a shortened Midwifery Training to become a State Certified Midwife. Although married at the time, Sue had to live in midwifery accommodation during part of this training but was rewarded by much experience of natural home confinements, before the increasing "mechanisation" of labour and delivery took hold. At the age of 23, Sue became a Midwifery Sister at “The Jessops”. 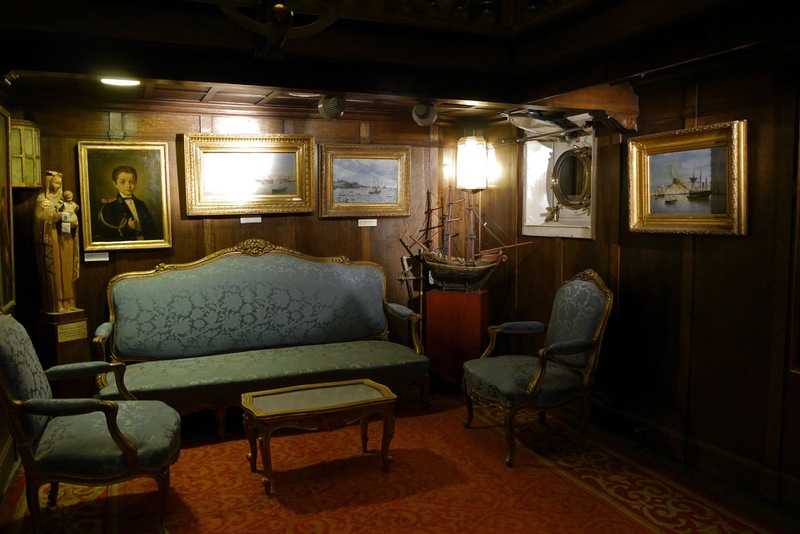 With yacht and dingy sailing as her main hobby, which required weekend’s off-duty, Sue left her position on the Delivery Suite and accepted the post of Sister-in-Charge of the Ante-natal and Infertility Clinics at the same hospital. She attained her certificate in Family Planning and undertook post-delivery advice to new mothers on the wards. She also became a Steward for the Royal College of Midwives. Very happy in this position, it was only following divorce that Sue considered moving to her favourite holiday and sailing retreat, Cornwall. In 1983, the perfect position of Sister-in-Charge of Ante-natal and Gynaecology Clinics at The Royal Cornwall Hospital Treliske became available and enabled Sue to fulfill a long-held dream to move to the County. In 1985 she attained the Certificate in Health Education at the Cornwall College. As well as some long-distance yacht cruising, sometimes as skipper, Sue raced on the Falmouth Working Boats for 16 years. In 2001 she took early retirement to join Ian onboard his ship, sailing from the UK as far away as Turkey in the Mediterranean and Olso in Norway, an experience that she loved. 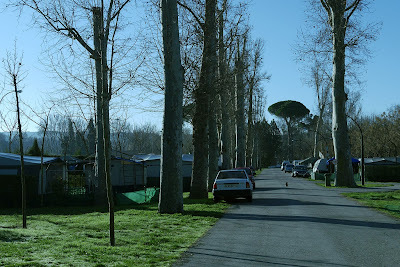 If you would like to contact us please use motorhometrips@tiscali.co.uk or post a comment. Always glad to hear from you.